Obv: Bust of Peter I (r): Legend in Cyrillic translated as "God Bless Peter the First, Tzar and Ruler of Russia"
Rev: View of ships at battle: Legend in Cyrillic translated as "Diligence and Bravery are Superior to Strength"
This was another important victory at sea over the Swedish fleet. 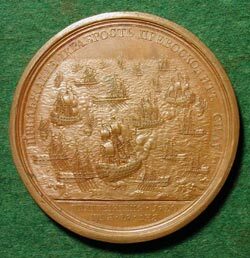 Two hundred medals, smaller than this, were also issued in silver and were given to officers who participated in the battle. Following the death of Peter in 1725, there was a great turnover of Russian leaders. Catherine I ,who succeeded him to the throne on his death became Empress of Russia in1725. 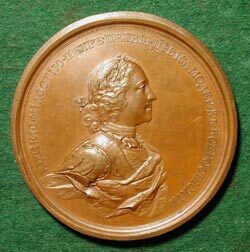 Just two years later in 1727 she herself was succeeded to the throne by Peter II (grandson of Peter the Great and Russian Tsar from 1727 to 1730). Peter II died of small pox on the day of his wedding in 1730 and was succeeded by Anna Ivanova, the niece of Peter the Great and daughter of Ivan V, the half-brother of Peter the Great. On the death of Anna in 1740, Ivan VI, the great nephew and adopted son of Empress Anna was proclaimed Emperor when he was only eight weeks old. In 1741 a coup d'etat took place and the tsarevna Elizabeth (the daughter of Peter the Great and Catherine I) was given the throne. Elizabeth (1709-1762) remained on the throne until her death in 1762, at which time she was succeeded by her nephew, Peter III, who died later that year, perhaps by murder. On his death Catherine II (The Great) ascended to the throne.